Students in the SUPER program study the physics of rollercoasters. Randolph College has received a nearly $1 million grant from the National Science Foundation (NSF). The grant will fund the Step-Up to Physical Science and Engineering at Randolph (SUPER) program through 2021. Created in 2010, SUPER is a four-year program that provides scholarships to a select number of students each year. The program includes academic services, tutoring, special mentoring opportunities, and career guidance support for those interested in science, math, engineering, and technology. The program is designed to help the students excel in demanding undergraduate courses while preparing them for graduate studies as well as careers as scientists and engineers. 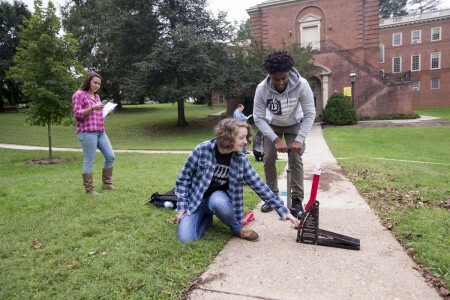 Randolph science students launch rockets on front campus. The SUPER program includes a two-week college transition program held just before classes start in August. Participants earn three credits for completing the intensive program, which gives them a head start on their coursework. This is the second time the College has received a grant from the NSF in support of SUPER. In 2013, Randolph was awarded a $600,000 grant that helped expand the program. Peter Sheldon, a Randolph physics professor and head of SUPER, said the grant will help the College build on the program’s success. Sheldon said a large portion of the NSF funding will go toward scholarships and innovative programs designed specifically to help Randolph science students succeed. One new program will be annual seminar courses for students that tie to research and career opportunities.